It can be very frustrating and even frightening when you are trying to communicate something important to your aging parent or parents and they won’t listen to or accept what you are saying. Adult children and their elderly parents may struggle as age, illness or physical challenges necessitate a change in an aging parent’s living circumstances. Self-sufficient adults who raised families, ran businesses and households, now face being told they can no longer live the life they spent a lifetime building, the way they want. It’s a tough sell on a good day. But there are ways to communicate with an aging parent that will make it easier to address tough life topics and decisions. First and foremost, even though you may think your parents are acting as stubborn as young children, they are not children. They are adults and any conversation you have with them needs to come from a place of respect and consideration. Don’t talk at your parents. Talk to them. Actually, sometimes it is what you are saying. “Mom, I don’t think you should be driving anymore” is probably not going to sit well in even the softest, sweetest tones. But tone does matter. Anyone who feels yelled at, harangued or bullied will often back away from the conversation and shut down communication. Take a careful look at how you are communicating because that may be at the core of why your parents are not listening to you. Many aging parents’ worst fear is of becoming a burden to their families. It fuels much of the resistance to getting help in their later years. Honestly explaining how their unwillingness to listen to you is causing that dreaded burden, will go far in bringing them back to the conversation. 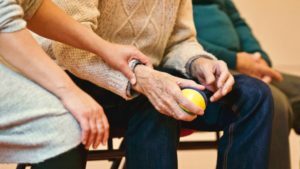 Rather than lay down the plan for your parents, whether it’s hiring someone to help them around the house and run errands, moving them to an assisted living facility or simply helping them declutter, bring them in on these decisions. Ask them what THEY want and try to accommodate them. 1. The number one tip for effectively communicating with a parent suffering from dementia is to first accept the situation for what it is. You are not talking to the mom or dad you grew up with. Dementia can alter personalities, perceptions and more. Talk to the person your parent is now. 2. Keep it simple. When talking to someone with dementia, keep your communication simple and the choices limited. Long, sequential questions with various potential answers will frustrate both of you. For example: Do you want to wear your loafers or your sneakers? Do you want chicken tacos or beef tacos for lunch? 3. Timing is everything. Talk to your parent when they can actually focus on what you’re saying. Avoid asking questions when they are visibly tired or distracted. Only you can prevent power struggles. Let’s face it, some dementia sufferers get downright ornery. In fact, most of us get ornery, even if we don’t have the excuse of dementia. When communicating with an aging parent, you are bound to encounter some infuriating behavior at some point. When it happens, let it go. Take a time out, ask siblings or other family members to step in, or seek professional advice, but don’t get sucked into a power struggle. No one wins, especially when you issue ultimatums or criticize. Aging is one of the few sure things most of us face in life. The common thread in all of these tips is respect and acceptance. When those two things drive your communication with your aging parents, it will always be more effective. If you have any questions about how to best communicate with your aging parents or caring for someone diagnosed with dementia, please contact Kristie Chadwick, a certified dementia specialist and Care Manager for Paradise Living Centers at info@paradiselivingcenters.com.